Fresh Black Tea Firming Overnight Mask from Nordstrom. s. What it does: This intensely moisturizing sleep mask has a corset-like effect on your skin, giving the appearance of a more defined, contoured complexion. A proprietary complex of antioxidant-rich black tea ferment, black tea extract, blackberry leaf extract and lychee seed extract is proven to inhibit damaging free radicals (in vitro test) and helps to improve skin elasticity while belle de nuit extract, known as nature's nocturnal flower, helps to soothe and rebalance the skin. The formula is further enriched with peptides to help firm the skin and visibly defy the signs of gravity, and hyaluronic acid to attract and maintain moisture to enhance suppleness. Research results: In a consumer test on 32 subjects over 28 days:- 97% noticed their skin looked visibly healthier after one month- 94% felt their skin was more supple and radiant after two weeks- 94% said their skin looked revitalized after one month- 91% noticed diminished signs of fatigue after two weeks- 88% saw improved elasticity and firmness after one monthHow to use: Massage a generous layer onto the face and neck. Leave on overnight. Can be used nightly as the final step of your skin care ritual. Brand: FRESH. 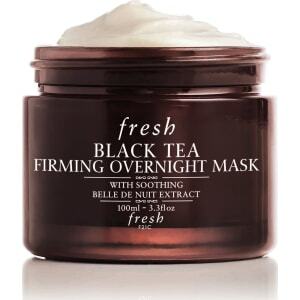 Style Name: Fresh Black Tea Firming Overnight Mask. Style Number: 1028757. Available in stores.